Obituary – McCubbins, Sylvia (Glentzer) « Perry High School Alumni Association, Inc.
Sylvia Glentzer McCubbins, a veteran school teacher died Monday, June 14, 1971 at age 76, in Greenbrier Nursing Home, Enid, Oklahoma. 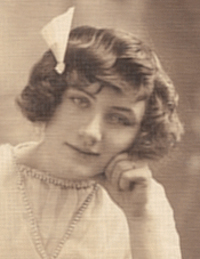 She was born January 5, 1895 in Independence, Kansas and moved to Perry with her parents as a small child. She graduated from Perry high school and received her Bachelor of Science Degree from Central State College July 23, 1931 and her Master of Science Degree at Oklahoma A&M College in July, 1939. She did extension work at the University of Oklahoma. On August 31, 1916 Sylvia Glentzer and Zach H. McCubbins (son of C. H. McCubbins) eloped to Guthrie where they were married. Family and friends greeted them with open arms on their return. Mrs. McCubbins taught school 46 years, beginning her teaching career at Red Rock Dailey School during 1913-1914. She was instructor at White School, west of Perry from 1914-1917. During 1917 and 1918, she was county assistant superintendent. In 1918-1919, she returned to teaching and was instructor at the 4-D school north west of Perry, after which she went to Sumner rural school in 1919-1920. She was the last to teach in Sumner rural school before it consolidated. 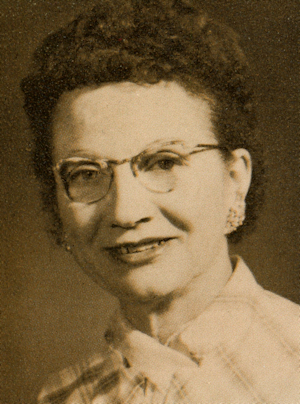 She was hired to be principal of the brick high school at Sumner, however in 1920 she resigned to return to Perry to teach in the junior and senior high school, where she taught mathematics from 1920 until her retirement in 1960. During her years of teaching, she sponsored girls’ basketball teams, pep clubs, supervised play programs for girls including swimming, and was active in Future Teachers and National Honor society. Upon her retirement, Mrs. McCubbins was voted “The Teacher of The Year for The State of Oklahoma”, and the Perry schools honored her with a special, “This Is Your Life”. She was an avid horsewoman, a member of the First Christian Church and the Perry Business and Professional Women’s Club. She was preceded in death by her parents, John and Margurite Glentzer; husband, Zach H. McCubbins, March 5, 1959. Survivors include seven nephews, Robert McCubbins of Perry; Clarence F. McCubbins of Enid; Herbert H. McCubbins, Ponca City; Charles Schuler McCubbins, Ernest Hilton McCubbins, Martin Hartley McCubbins, all of Jackson, Mississippi; Jack Shiffer, Creswell, Oregon; and two nieces, Mrs. Lillian Lynn, Oklahoma City, and Mrs. Sylvia Stocker, Decatur, Illinois. Funeral will be at 2 PM Wednesday in the First Christian Church. Rev James Lambert, pastor will officiate and burial will be in Grace Hill Cemetery under the direction of Newton Funeral Home.